Michelle Williams always rocks demure, vintage-inspired frocks and last night was no exception. Her classic red Valentino gown was adorned with feminine lace detailing and Michelle added some red sandals and a crimson box clutch. What did you think of her head-to-toe red look? The SAG Awards are more laid back than the Golden Globes or Oscars, so I love that The Descendants’ Shailene Woodley chose to wear this really fun, young, and colorful L’Wren Scott gown. The Hawaiian-like print seemed to be a nod to her film’s setting and the baby blue hue with pops of red made a statement. Shailene kept her hair and makeup low-key, in order to let the dress be the focus. 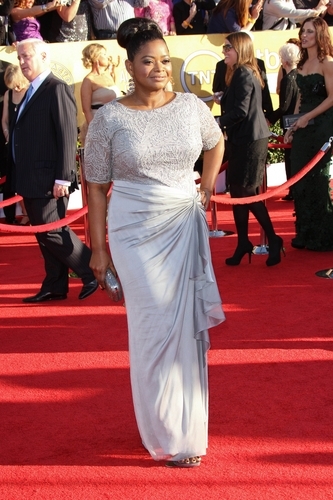 SAG Award winner Octavia Spencer was one of the first stars I saw on the red carpet last night, but I kept thinking about her silver Tadashi Shoji gown the entire time! The shimmery dress had a great mix of textures — a delicate floral-applique top and super-flattering, silky wrap skirt. Octavia also sported a sleek updo, which really showcased her lovely statement earrings. Emma Stone killed it fashion-wise at the Golden Globes a few weeks ago and she once again looked amazing at last night’s ceremony. Her tea-length Alexander McQueen dress channeled Old Hollywood, while the sky-high ankle strap pumps and gold-handled clutch kept the look modern and youthful. Can this girl do no wrong?! This little number from the Givenchy Spring ’12 couture collection had a lot of fashion commentators on the fence, but I for one was in love with this dress. The gown has a kind of edgy-meets-glam vibe and while not everyone could pull off what is essentially a white tank under a mesh top, Zoe did it flawlessly. How gorgeous is this Oscar de la Renta gown?! Emily Blunt stood out last night in this bright, kelly green frock, which perfectly complemented her coloring. She completed her glam look with with a simple updo, several sparkling bangles and a matching clutch. Rose Byrne took a definite fashion risk on last night’s red carpet with this sleek Elie Saab pantsuit. This was a prime example of a “love it or hate it” kind of look — you either think it’s fabulous or a fashion disaster. We love that she took a risk – what did you think of Rose’s daring ensemble? Lea Michele showed off her looong legs last night in a Grecian-style Versace gown. The soft, gray, sculptural dress definitely turned a lot of heads on the red carpet with its thigh-high slit, but I really loved the way Lea toned down the look by wearing her hair down with a simple side part. Outstanding Lead Actress winner Viola Davis made a statement on the red carpet in this white Marchesa gown with an ornate golden overlay on the bust. Both shades complemented her skin tone flawlessly and made her positively glow, while her coordinating accessories were the icing on the cake. Okay, so I’m on the fence with this one: I really liked this simple and chic white Balenciaga gown, but I could NOT get past that weird, chunky choker! It seems like such an odd choice to wear with a halter-neck gown and didn’t match the rest of her look at all. What do you think– did the choker make this look a fashion faux pas or you willing to give Kristen a pass?